14-year-old Jimmy Dolan has been shuffling from orphanage to orphanage since the sudden death of his parents. Lost and confused with a strange voice speaking in his head, he is abruptly adopted by his “Aunt” Vanessa (whom he’s never met) and thrown into a world where he must learn to fight to survive. On the run from an evil industrialist known as Kotogawa and his band of assassins, Jimmy flees the United States and heads to Japan where he learns that he is the last inheritor of a ninja family lineage. 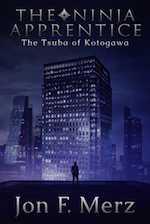 Tasked with finding nine sacred relics stolen from his family, Jimmy must learn the ways of the ancient Matsuda-ryu ninja warriors, recover the relics and battle against Kotogawa, whose hatred for Jimmy’s family runs back nearly one thousand years. Only then will Jimmy be able to reclaim the honor of the Matsuda-ryu Ninja and become the head of his family. In the mountains of Nepal, he’ll get his chance. But will his training prepare him for the coming battle? 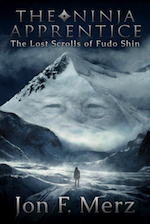 The Lost Scrolls of Fudo Shin is book one in this new exciting series from the author of the bestselling Lawson Vampire series, Jon F. Merz. It is packed with authentic ninjutsu techniques, strategy, and more culled from the author’s training in authentic Togakure-ryu Ninjutsu for over twenty-five years. There are other ninja adventure books, but none written by an author who studies the real thing!